Design ideas for a mid-sized arts and crafts backyard full sun formal garden for summer in Minneapolis with a garden path and natural stone pavers. 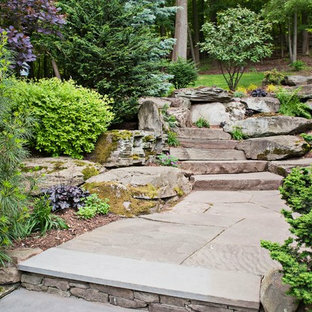 Mid-sized traditional sloped full sun formal garden in New York with a garden path and natural stone pavers for summer. By Simmonds & Associates, Inc. This property has a wonderful juxtaposition of modern and traditional elements, which are unified by a natural planting scheme. Although the house is traditional, the client desired some contemporary elements, enabling us to introduce rusted steel fences and arbors, black granite for the barbeque counter, and black African slate for the main terrace. An existing brick retaining wall was saved and forms the backdrop for a long fountain with two stone water sources. Almost an acre in size, the property has several destinations. 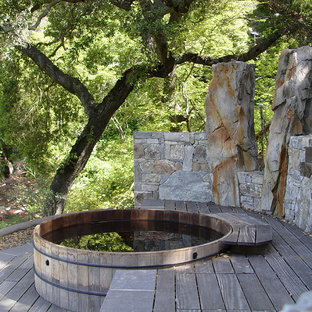 A winding set of steps takes the visitor up the hill to a redwood hot tub, set in a deck amongst walls and stone pillars, overlooking the property. Another winding path takes the visitor to the arbor at the end of the property, furnished with Emu chaises, with relaxing views back to the house, and easy access to the adjacent vegetable garden. Photos: Simmonds & Associates, Inc.
Mid-sized traditional backyard garden in San Francisco with a garden path and natural stone pavers. Mid-sized traditional backyard full sun xeriscape in Denver with natural stone pavers for summer. 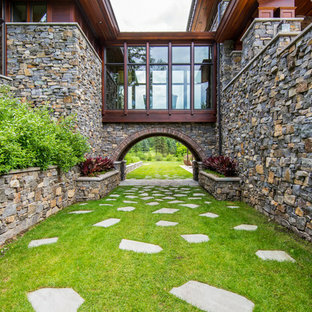 The planted flagstone stairs offer an enchanting alternative to the entry of a residential home that was built on a hillside. 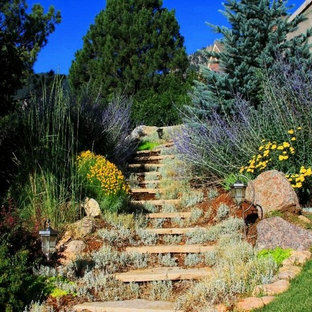 Design ideas for a traditional sloped garden in Denver. 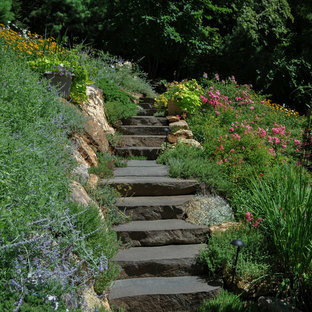 This is an example of a traditional sloped garden in New York with natural stone pavers. 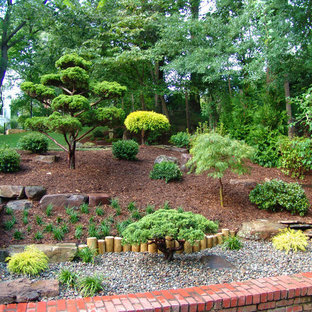 Photo of an asian sloped garden in DC Metro. 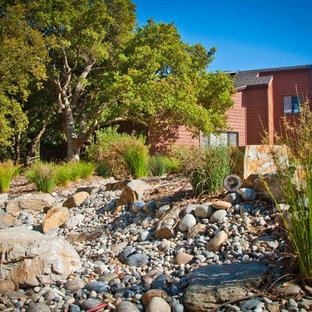 By Mark Sullivan Fine Custom Homes Inc.
Photo of a contemporary sloped garden in San Luis Obispo. This is an example of a large backyard full sun formal garden in Other with natural stone pavers and a garden path. Mid-sized traditional backyard full sun garden in New York with concrete pavers for spring. By Paul Roth Architect Inc.
Photo of a beach style exterior in Toronto with wood siding. Photo of a traditional natural pool in Atlanta with a water feature. 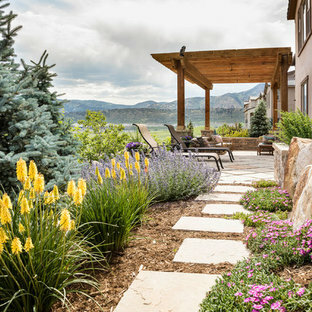 Inspiration for a large transitional side yard partial sun garden in New York with natural stone pavers. Traditional sloped garden in Baltimore with a water feature. 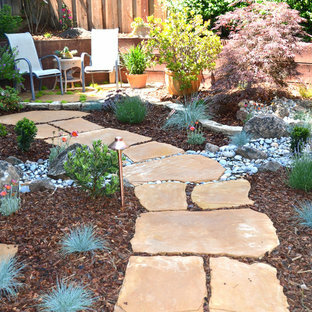 Inspiration for a large contemporary front yard shaded xeriscape in San Francisco with gravel.